SOLD OUT! Please call 610-644-8237 to be put on our waiting list or for potential sponsorship opportunities. You're invited to an evening filled with Tony Award-winning performances benefiting Amigos de Jesús, a home for children. Our evening will kick off with a cocktail reception where our guests will have the opportunity to mingle with the children visiting from Honduras. The evening will feature spectacular solos and duets by the sensational Mandy Gonzalez and Chris Jackson along with a special performance from National Youth Poet Laureate Amanda Gorman. It will be a night you won’t want to miss! Title Sponsorship at $20,000 - VIP Producer seating for ten; full page ad in Playbill; Meet & Greet with Mandy Gonzalez, Chris Jackson, and children of Amigos at champagne reception; 2 VIP orchestra tickets to see Hamilton on Broadway; 2 backstage passes at Hamilton on Broadway with cast Meet & Greet. Platinum Sponsorship(s) at $10,000 - VIP Front center orchestra seating for eight; full page ad in Playbill; Meet & Greet with Mandy Gonzalez, Chris Jackson, and children of Amigos at champagne reception; 2 orchestra tickets to see Hamilton on Broadway. 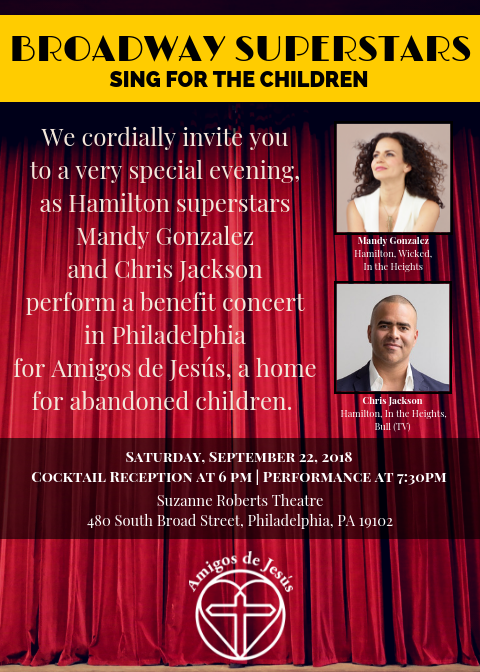 Gold Sponsorship(s) at $5,000 - Center orchestra seating for six; full page ad in Playbill; Meet & Greet with Mandy Gonzalez, Chris Jackson, and children of Amigos at champagne reception. Silver Sponsorship(s) at $2,500 - Premium seating for four; half page ad in Playbill. Bronze Sponsorship(s) at $1,000 - Two tickets; quarter page ad in Playbill. Patron Sponsorship(s) at $500 - Two tickets; name recognition in Playbill. Single ticket(s) at $125 - Limited quantity. View More Events Organized by Amigos de Jesus. This event is organized by Amigos de Jesus.